Create dashboards using Power Pivot and Power View in Excel. Microsoft’s revolutionary Power Pivot is a tool that allows users to create and transform data into reports and dashboards in new and much more powerful ways using the most-used analytical tool in the world: Excel. Written by a member of Microsoft’s Power Pivot team and one of the leading Power Pivot bloggers, this guide to the business analysis resource follows Jim, a fictional business analyst, as he attempts to create a dashboard report for his CFO that will allow him to see business performance and drill down into the reports for additional details. Readers will learn what a dashboard is, how to design one, and how to create Power View sheets that allow for additional levels of reporting and highly interactive data visualizations. The book covers in detail how to combine and shape the relevant data, build the dashboard in Excel—providing layout and design tips and tricks—prepare the model to work with fiscal dates, and show values used in many financial reports, including year-to-date, variance-to-target, percentage-of-total, and running totals reports. Accessibly written, this book offers readers a practical, real-world scenario and can be used as a day-to-day reference. 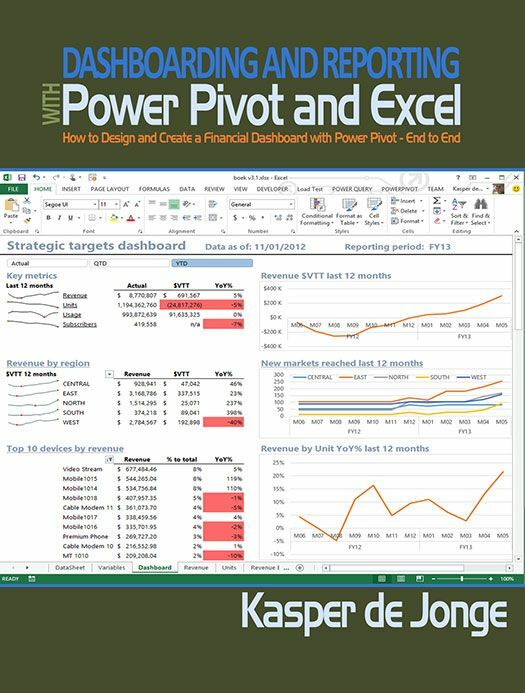 Though the guide focuses on Power Pivot for Excel 2010, a chapter that discusses Power View—compatible with Excel 2013—is also included.